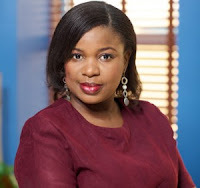 Chimezie Obi-Iwuagwu is a producer with Channels Television. She is happily married and blessed with Children. She attended the Imo State University(IMSU) where she graduated with a degree in mass communication. She went further to obtain a Masters degree in public administration from the University of Lagos(Unilag),where she specialized in public policy. She had the fortune of doing her compulsory National Youth service at Channels Television and she was retained in the establishment in 2004 after her service. Prior to her being on the business desk, she was the producer/presenter of the programme, Business Incorporated and Capital Market. Aside from programme production/presentation, she has also been a reporter and has spent some time reading business news. In 2009, she won the Continental Service Merit Award from the Senate of the African Youth Society based on her outstanding contribution to mass communication, international friendship, news and current affairs, continental diplomacy and global journalism. She anchors the flagship business programme, ‘Business Morning’.